Wow! 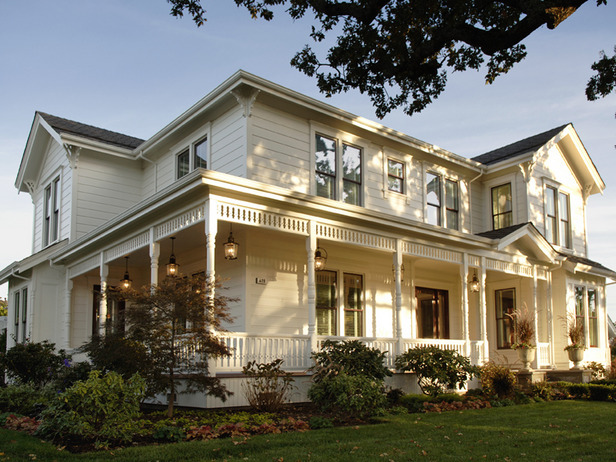 Have you seen HGTV’s Dream Home 2009? 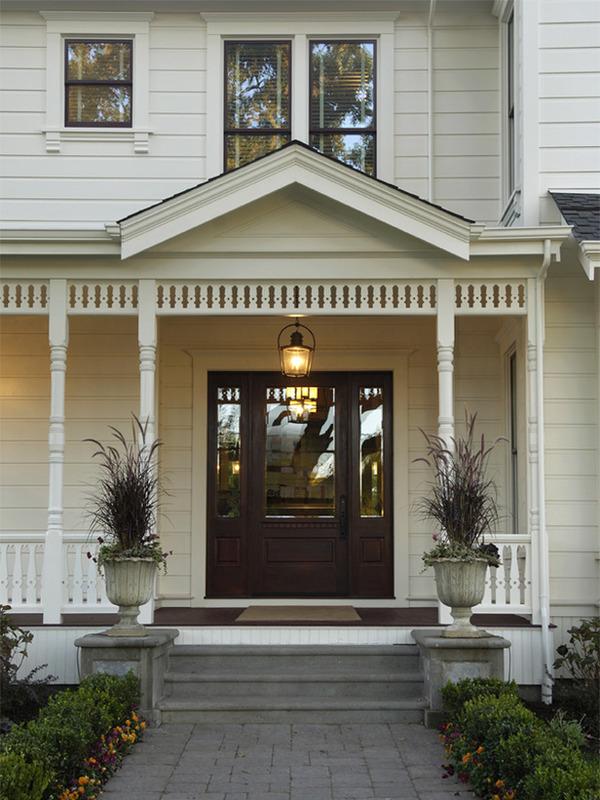 I love the white farmhouse look and all of the gorgeous details on the front porch. You’d never know it was brand spanking new. At least not until you stepped inside. Aren’t these light fixtures great? Take the virtual tour at HGTV and see what you think, or watch the Dream Home Special tonight at 9p/8c. I wasn’t as thrilled with the inside of the house as I was with the exterior (but that won’t stop me from obsessively entering the sweepstakes every day between now and February 19, and if I win, you can bet I’ll be more excited than Stephanie Dee was last year). My main issue is that the interior looks too “new.” Wouldn’t you expect a house like this to have crown molding in the rooms? I didn’t see any. And the way they painted each room’s ceiling to match the walls made everything just kind of blend together. Maybe they’ll explain that in the special tonight, but if I win this place, the first thing I’ll do is get some crown installed. And I’m just not digging the kitchen, based on the virtual tour, anyway. Feel free to tell me I’m crazy if you loved everything about it, but it didn’t do much for me. Would I want gray walls and a gray ceiling with cream cabinets in my farmhouse kitchen? No. No, I would not. It’s just a little drab. There’s not even a tile backsplash to brighten things up. The gray counters blend into the gray walls and gray ceilings. Hope you had a wonderful New Year’s and didn’t spend your night, say, taking care of a sick 6-year old who woke you up every hour, on the hour. Yawn. The year hasn’t started out too well for us here, but that just means it has nowhere to go but up, right? Here’s to a Happy and Healthy 2009! The outside of the house is beautiful Julia! Wish I had cable. I love HGTV. Maybe it is a good thing that I don’t. LOL! Happy New Year! What a gorgeous house, I think that is my dream house no question. I wish we got that channel here in the UK. The outside is beautiful! But I’m not digging the kitchen either… it just seems apartment-ish to me. I think I like the ceilings being the same color, but again I agree there should be some crown molding. I’ve never seen curtains just hung on walls like there are in the foyer. I like the way that looks better than just doors. I think it makes it feel “warmer”. By the way, love your site! Shoot! Sorry that your and youe son’s didn’t start so well. Hopefully he’s feeling better today. I loved the outside as well but was very disappointed with the inside. I was so excited they finally did a dream home in California, but that quickly faded once I saw the inside. The outside is so lovely it hurts. I actually like many of the interior rooms, but NOT in that house. The family room especially did not fit. Modern leather sofas in a farm house? Who does that? I liked the layout of the kitchen and positively drooled over the oven but the colors were too…blah. It should have been painted a brighter color. I wish I could get HGTV! Gah! Not loving that kitchen either…do love the shiny floors however. The porch looks inviting and begging to have folks gather ’round a pitcher of lemonade…can you tell I am longing for warmer weather? I hope that your sweetie pie feels better soon…we had the flu here too…fun~ola huh?! Hi, Julia, Happy New Year! I love the outside of this house & looked quickly at the kitchen virtual. I’m with you…the kitchen needed to be more farmhouse-y, IMO. And it totally needs crown. That’s what sets older homes apart from new ones so much, all the extra molding. That’s a yummy factor that I love. Beautiful exterior though! I could totally dig that. De-lurking to comment . . . I like *parts* of the kitchen but not the kitchen as whole. It almost seems like wasted space. And what’s up with a “farmhouse” not having a farmhouse sink?? That’s just wrong. The family room seems tiny and totally out of whack and my other dislike is the “kids” room. Uh, no. That’s a BOYS room. I think the kids’ rooms in previous Dream Homes were much, much better than this one. For 3600 square feet, the house seems tiny inside but I do like it. Not sure it’d work for my family but as a getaway home, it might kinda cool to win! The exterior of the home is absolutely stunning, though. I love this house, I posted about it, too 🙂 I wanted that pic with the urns on my blog, too, but my computer was acting up…love those urns! I only went to HGTV.com on a whim this morning because I thought for sure they were not doing this giveaway this year because I have not seen any commercials on HGTV at all about it and usually they promote the heck out of these things…weird. Hope one of us or someone we know wins, wouldn’t that be cool? Happy New Year, Julia! I haven’t checked out the house yet, but I plan to do that this afternoon. I wonder if the same decorator did this home. I’ve really liked her work in the past. The outside of this house is AMAZING, but I agree with you that it’s missing some crowns. I read your comments before viewing and I couldn’t help but feel those walls were crying out for some crown molding. I wasn’t crazy about this inside of the house, but I admit to not having a lot of patience for the website loading everything! HGTV’s dream house contest-someone’s gotta win -right? I will tell you what I think once I check it out. But the exterior is fantastic! I absolutely adore the farmhouse style!!! I think if you are going to design a house from a specific era it should match as much as possible inside and out. Of course you want modern ammenites but I think that kind of design work is an art form only a few have mastered. I think what has changed with building homes today is that homes used to be built by one builder -one man maybe a crew from top to bottom inside and out. Now you have a different crew for every thing from drywallers-to roofers to well you get the idea. And sometimes the vision just gets lost. My dream is to own my own home again-I hate renting and I wish I never would have moved from my home that I designed-UGGHH!Hope you are having a good New Years-2009 is going to be a very good year!!! Happy New Year Julia I hope you and your wonderful little family have a fabulous 2009 it’s been fun getting to know you, thank you for your friendship, First thing I did this morning was enter 🙂 But I so agree it is not one of their best houses. Hey wouldn’t it be fun to go back and look at all the other HGTV houses and see which one is the most popular amongest bloggers ??? I love this house the MOST out of all of them! It is so DREAMY! I always get excited about HGTV’s dream house and am always sure I will win. I looked at the tour a couple of days ago and I thought everything you said – LOVED the outside, didn’t love the inside, especially the painted ceilings. Two islands lined up like that in the kitchen seemed odd to me. I did really like the Master and Master bath. I’m partial to green. Though I thought they could have done better, it’s still pretty amazing and I’ll be doing my best to win this time around! I thought last year’s house was a DOG so I didn’t even enter! I have DVR’d this year’s because it looked so pretty — but NO CROWN? What the ??? I am so glad that I am not the only one. I liked the outside, but was super disappointed with the inside. bummer. I actually wouldn’t want it and I think I saw a photo of the neighborhood. It seemed an unusual fit. I love the exterior. The interior has good bones, but I would not personally hire the designer (even if I had the money!). You’re right, it needs crown molding. And different colors. Hate the kids’ bathroom, and the dining room looks ’80s to me. And the kitchen is too modern. But I wouldn’t turn it down if I won! I’m back from Colorado where I met my first grandchild. It was absolutely wonderful! I had to come by to wish you and your family a very HAPPY 2009! I wish you good health, happiness and prosperity in the new year! Oh no!!! Does the same thing apply to the new year as does to March…in like a lion and out like a lamb?? I hope all is calm again in your house. Happy new year, dear Julia!! Thank you so much for bringing…so much! My life is definitely brighter with your blog. You’ve made me laugh with your writing more times than I can count. (Laugh ’cause it’s funny. Not laugh at your writing ’cause you don’t know how to write, LOL! I realize when I read that statement it could be open for interpretation. 🙂 I just love everything about your blog. There is a serious conflict between the exterior and interior of the home. I think they definitely chose the wrong designer/decorator to style it and choose finishes. I don’t get it…why go to the bother of recreating the exterior with authenticity, and then make the interior look like that? Way too modern for me, but that’s just my opinion… Still, I wouldn’t say any of that if I won it!! Oh, and Happy New Year, Julia!! Thanks for consistently delivering great posts and inspiration…I love coming here! It is a lovely house. The porch needs some seating though and ferns. The area of Sonoma seems spectacular. I thought the exterior was attractive, but the interior didn’t do it for me, either. The best two rooms in the house were the front living & dining. After that, I disliked all the rooms featured. The kitchen and family room were big turn-offs for me. Did everything seem small and crowded to anyone else? I wonder if it’s a trick of the 360 lens. I am just an “untrained eye” and LOVE homes, architecture and have loved your site here since I found it last month – that said – I am so glad to read your take on the house. I was so disappointed by some of the interiors on this house. Especially the kitchen – and the lack of crown. Of all the Dream Homes I think that if I was lucky enough to win this one, it would be the easiest one to part with when the taxes came due! Just looking at the virtual tour – I’ve not explored the other links on HGTV or seen the special, I dislike the home site – it doesn’t “fit” with the homes across the street in my opinion, I imagined this home in a very rural setting, not in what looks like an average suburb. Thanks for your website – I have so much fun looking around when I pop in here! Happy New Year, Julia! I hope that Lily is feeling better today and your husband and son are also well. I also like the outside of the house even though I’m not particularly partial to “farmhouse.” What makes the interiors awful for me is that I HATE orange. Not that I love brown. I laughed at the pictures of the master closet since they kept all of the clothes and the shoes in neutrals to match the decor. Love that the master bath has the divider built-in between the sinks. Hi and Happy New Year. As family should always come first, I hope both you and your son are feeling great. I agree completely that the kids bedroom, the kitchen and the living room could all use improvment, but what about that home office? Whoever heard of a home office without any place for papers? Those 2 inch desk drawers aren’t going to cut it. And as a wine tasting room? With all those windows? P.S. I think the antibiotics are working this time around for Lily (first round didn’t). Thanks for all of your well wishes for her. She’s been a very sick girl for the last two weeks. Completely agree about the kitchen color as well. The wine room/office felt excessively multi-tasked. Love the dining room color. I LOVE the dream home!!! It’s just amazing! It would be the perfect house to live in, and I can finally leave my San Francisco apartment. I’ve always wanted to live in Sonama. It’s so peaceful and tranquil. And much different than the busy streets of San Francisco. I HOPE I WIN!!! Congrats on 1,000,000! I stumbled across your site quite by accident and must confess that I visit it daily to see what you will come up with next. You do this will class and style! Thank you. I don’t care for a lot of the rooms in this house which is strange because I usually love the HGTV Dream Houses. I think many of the furnishings are too modern for a Victorian farmhouse. I entered to win it for the first time a few minutes ago and I wouldn’t turn it down if I win, but it isn’t my favorite! When I think of wine country, I think of houses like the one in the Parent Trap movies! I would like to invite you and your many readers to visit my nest during January for my organizing ideas and tips! I hope to hear from you if you visit! Happy New Year! I love the outside, love the location, and of course would be thrilled to be the winner. But I have to agree, with some of the other comments about the interiors. Not loving the same colored ceilings and crown moldings are a must. Also, I would immediately redesign the home office. The desk is in the middle of the room! Where to the wires go when you set up your computer and phone?? And why would you put a wine closet in the office? That is just weird, unless your home business is directly related to wine. The office and the kids bedroom seemed to be more about the designers than the future homeowner. The master bedroom green is a bit too dark for my taste. Love the kitchen, but would replace that breakfast table. Happy New Year Julia ! Totally agree with you on the kitchen – in fact, the entire house was blah blah. Such an adorable exterior – a shame really. Good luck with your entries ! I like this house a lot and my husband is watching the tour on tv for the first time now. He likes it too! I would not want my own vineyard, so I would make that plot at the top of the driveway into a vegetable garden instead. I like that it is a half mile walk to the farmers’ market. I was so disappointed in the 2009 Dream Home. I LOVE the outside but I don’t feel the inside fits the outside. Now I love color, but the kelly green in the MB was just obnoxious. I agree about the kitchen, it was very DRAB! I thought the living room was pretty and I really liked the guest room but that was about it!! I don’t enter because there is no way I could afford the taxes on it so I’ll let you win it and I will come visit you!! I’m so glad they chose Sonoma to build their dream home this year. It’s so beautiful there, and the home is just gorgeous. I have always found the dream homes really cool BUT, as a real person what is it with no bathroom on the first floor????? And Sonoma begs you to get out and live so a room off the kitchen to clean up after being outside would have been a great convenience. I was really happy and excited that they did a home in my native California, and in my childhood turf. Could move in tomorrow! But, Half-moon Bay would have been better………I loved the house (wish for a more kid friendly home, the cream curtains in the entry way would have to go) but I stumbled on to you blog, and your comments are right on! Now I’m super bummed, no crown nd would need to repaint few rooms, but know that it would be a home my family could grow in, and fix to our liking. Its not my dream, but it could work(well!). Beats this apartment, with not one once of charm! HGTV homes are always good and this is no exception. I have seen lot of great designs and this is one of them. This dream home really makes a dream come true. This was my least favorite dream home to date, mostly because of the paint choices. I love the outside of the home and the setting, though. Where did the porch lights come from? I love them. 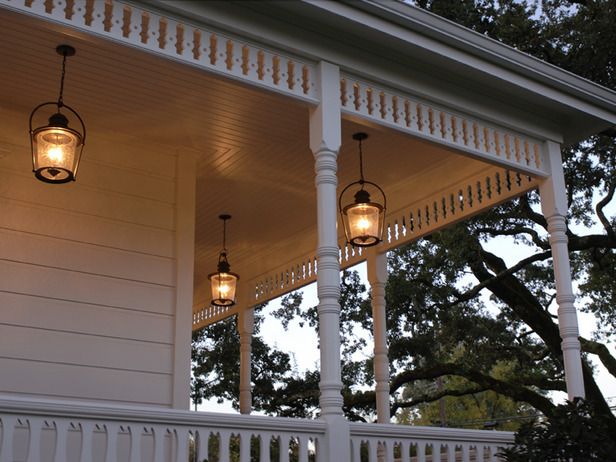 We love those porch lights!!! where can we find them??? Please!!! I LOVE this front door. Could someone please let me know the manufacturer? Thanks!